Welterweight boxer Lewis Benson revealed he had to overcome his nerves before taking care of Hungarian Zoltan Szabo at the Emirates Arena in Glasgow. 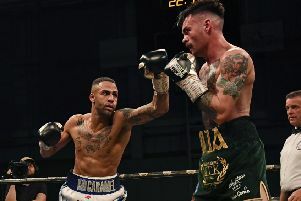 The 27-year-old MTK Global fighter was making his first appearance in the ring since announcing his intentions to retire from the sport following a controversial single-point defeat to Belfast’s Tyrone McKenna in November. However, Benson, who trains out of Lochend Boxing Club, is back with a vengeance and plotting his route up the division following a comfortable points win on Friday night. But the build up to the 11th win of his professional career wasn’t entirely plain sailing as the former Scottish and British amateur champion explained. “I felt really good in there. I stuck to my game plan, got the rounds under my belt and came away with a convincing win,” said Benson who represented Scotland at the 2014 Commonwealth Games. “That said, I felt really nervous. It’s the first time I’ve felt that way in a long time. I knew with me coming back that I couldn’t afford to not look good. It was strange because even though it was, we’ll call it a nothing fight, at the same time it was absolutely huge. “But as soon as I arrived at the venue, saw a lot of faces I recognised, I switched on and I was fine. It was kind of going into the unknown, a really weird feeling. I got up for the first round I knew exactly what I needed to do. I loved being back in the ring. “It was very straightforward, pretty easy to be honest. I got the job done and that was the main thing. I just had to win the fight, look good and not get involved in too much. Benson is now hoping his management team come up with the goods for his next bout.